Flames enjoyed talking to yet another Firewing and he was hoping that he could make another friend. After his expirience with Nisha, he was more confident then before and now was a bit more social. He looked carefully at the female standing before him, studying her looks, he liked the nice flames on her body, a bit jealous that he himself only had fire on the end of his tail. After a while, Flames slowly picked his book back up as he was asked a question. "Oh this?.... This is just a small continuation to another book I wrote." he replied, opening the book and looking at his work. "Wow." Nemesis fanned her wings a bit and sat next to Flames. But not too close. She didn't want to invade his personal space or anything... She wondered if the two had much more in common. There was, of course, the fire they had, but that wasn't much of a... significant similarity, if you will. Two dragons have the same color scales, what's the big deal? Of course Nemesis knew that the two shared the same admiration and reverence for books, but of course, Nemesis being Nemesis, the dragon remained curious about this semigod. And she was shocked with herself; she had actually held up a conversation with a dragon without any awkwardness! Yay! "You, um..." Nemesis furrowed her crimson brow, deep in thought. What should she ask him..? She wrinkled up her snout in an almost comical manner until she finally came up with a question that wasn't all that creepy or sudden. "Come here.. often..?" Noticing Nemesis sit relatively close to Flames, he smiled warmly at her, enjoying her company and happy that he was able to continue a conversation without getting too nervous. He set his book back down, setting it between him and her and looked back at the nice sky as he waited for her response. Hearing her 'wow' he chuckled a bit as he barely ever got a response like that when it came to telling others about the books he had wrote. She soon spoke, he heard her words and slightly got a bit nervous. "Actually.... Yes, I do come here often... It's my favorite spot to just watch the clouds, the sky, the birds, as well as just sit back under the sun or moon continue my writings." he replied, slightly nervous. Nemesis followed Flames' gaze to look up at the sky. When he chuckled, she was suddenly glad she was a red-scaled dragoness; that way it was hard to see her blush. She was flustered enough already. So many things going on at once!-- She met a large elderly EarthWing named Eysseth who was friendly, thank the gods, alongside a youthful FireWing rogue with the name of Ardent. And now here Nemesis was, talking to one of the FireWing leaders! And she hadn't even embarrassed herself yet! Yay! When Nemesis heard the nervous tone in the male's voice, she frowned. Had she intruded on something..? Despite her fret, she still spoke in her usual tone: melancholy, barely audible, and shy. Nothing ever different there. "Y- Yeah. Sun. The sun is my favorite..." She sniffed, then hastily added, "S- Sorry if I asked a question that was too...u- um..!" She didn't have the words, but she hoped Flames got the idea. Flames looked at her back, to see her facial expression to his reply. He thought that the Dragoness next to him looked amazing and not like any other Firewing he met before, though, he didn't want to embarrass himself, he just wanted to have a calming conversation and hopefully get a new friend. He didn't have much friends, only a traveling Dragoness and a small hatchling named Ventus. So adding a new friend to his list, would simply be amazing. He listened to her words and chuckled slightly from her response. Understanding what she meant, but he didn't mind it, as it definitely was possible for a normal dragon to say that to anyone without it being romantic. "Oh that's perfectly fine, I don't mind.... I'm sure that's not what you actually meant." he replied, looking calm. Nemesis shuddered, although the temperature was fairly hot. She was just so nervous, so worried that she blew it... Then she looked up, and saw Flames' face. Tranquil... No worries... No sign of anger, anxiety, fear... He was even a bit handsome-- well, no, scratch that. Okay, he was really handsome. She found herself smiling at his glossy black eyes, and once again she was glad she was a red-scaled dragon. Nemesis thought about what she discovered about Flames so far. He was confident. Creative. Social... Everything Nemesis wasn't. Instead of feeling sad about that or even a little jealous, she discovered she respected the god for that. Suddenly she held up a vast quantity of admiration for him-- not in a romantic way (yet), but he seemed more of a role-model. Flames was cool. "Heh.." Nemesis kept smiling, and she was quite sure she looked like a dumb bunny with a stupid grin on her face. "Y- Yeah. Not what I.. um! Meant! Yeah." She glanced around, trying to find something to talk about. Um. That blue bird looked interesting, uh... The song. It was pretty. Yeah. Oh wait. Song! Music! That's a thing to talk about! "Do you, um, like.. uh... like music?" Flames continued to enjoy talking to Dragoness beside him, who looked to be near his age. He could easily tell that she was very nervous. It reminded him of how he acted when he first met Nisha, he felt nervous talking to a female like Nisha, but she helped flames greatly in confidence, which is mainly why Flames didn't act shy or nervous when talking to Nemisis. He began to think about her question. Music? Flames never really thought about music until now. Music wasn't something that would often go into his head, it was more of something he didn't bother to listen to. "Well... uh, music isn't something I tend to think about or listen to... music is something I sorta ignore, as I prefer to just read in peace or write books without any disruptions." Flames replied, still calm, but yet enjoying the questions he was being asked at the same time. Nemesis listened to the male's question and answer, nodding. It was okay that he ignored music, whilst the smaller female relished in its presence. Not everyone can have everything in common. Besides, if Nemesis were to want a few minutes on her own, she may not want any noises to disrupt her alone time. She isn't in the mood for music all the time. As the conversation progressed, Nemesis felt herself getting more and more comfortable with Flames' presence. Not that she wasn't already. This was just what often happened to her in most conversations if the fellow dragon was kind, so she wasn't all that surprised or mystified. "oh..." Nemesis stood and looked up. The sun was just sinking below the horizon, casting a blazing orange glow. Fingers of amber stretched across the sky. "The sun is going to sleep...." She looked down at Flames again, smiling. "The moon... It's okay too..." She meant it. "I like it.."
Flames looked back up at the sky as Nemesis stated that the sun was sleeping. At this time normally Flames would be gone by now, as he would always go back to his volcano during the sunset. Though the conversation he engaged in with the slightly smaller female changed his schedule a bit. He barely had any time to talk to anyone, but he felt like he had finally gotten a friend and would talk to her until she had to go. "The moon is.... Ok in my opinion, thought I do like the sun a lot more...." Flames replied, now going back to looking at her, He thought she looked absolutely marvelous, which was rare, usually he didn't find females attractive, but this one was an exception. "You know... usually everyone I would chat with would be gone by now." He replied, now getting a bit nervous. Nemesis saw Flames look at her from the corner of her eye. Not that she had any trouble with it, but she felt her cheeks go up a shocking degree. She was positive her ears were steaming out smoke. This was weird, especially for shy Nemesis. She never acted this way before, and she was even more confused why she was acting such now. Maybe it was Flames himself? As the male spoke, she realized there was... A hint of anxiety. Nemesis was comforted by this... So she wasn't the only one nervous. But... What was he nervous about? Had she said something wrong...? "Um... S- Sorry if I'm k- keeping you..." Nemesis smiled softly. "Urr... Hey. If you want to be friends... You can come to my den sometime." She regretted the words as soon as they came out. Ugh!! Now it'd seem like she was asking for a date!! "O- Or don't." Nemesis corrected herself quickly. "N- No pressure. I can show you just in case. Or, um... W- We can m- meet somewhere else. Uh... I didn't mean it like that, but--- oh gee, I'll rant again..."
Flames let out a quick chuckle at her words. He was only a bit nervous, but hearing the dragoness speak nervously and try to take back her words was a bit amusing to him, not that he was making fun of her, he just felt special hearing dragons get nervous when they spoke to him, like he was some kind of god or semi god.... Oh wait. "I understand, don't get nervous, once again, I know you aren't thinking like that or trying to sound like that's something you want." Flames replied, then began to think before continuing his words. ".... Hey. I don't know if your busy right now... Eh.... Maybe you can follow me back to my volcano and we can just sit and chat there?" Flames asked, slightly blushing as he didn't know if the request he made was ok with her. A sigh of relief escaped Nemesis' maw as Flames was forgiving for her rather skittish attitude. She smiled, this one a little larger than the ones displayed so far. A conversation usually wouldn't last this long, as the FireWings are a busy Tribe. Or, if Nemesis didn't like the dragon she was speaking to, she would make up some excuse to leave. But she didn't even consider this case for this encounter with Flames. Flames was nice, but wasn't really like what some dragons did to Nem. They'd be like 'oh, you poor thing! You are a cripple! Tell me whatever you need, and I'll help you, okay dearie?'. Nemesis was grateful for Flames' ... Well... Not fretting over her like that. She pricked her ears up at his request. "Y- Yeah..! That sounds f- fun." She grinned at him (agaain) and blushed as well. Flames smiled happily at her as she accepted his offer. He wasn't meaning for it to be a date or anything, just a calming chat like he once did with Tempest, as well as being able to hopefully have a firewing friend that would come around from time to time. He got up and spread his wings out, getting prepared to leave the area and go to his volcano. "Alright, tell me when you're ready to go." He said carefully, holding his quill in his paw and his book with his other. Nemesis stood up with Flames, leaning herself forth and stretching her talons' toes out, similar as a feline would. She let her tail curl up in response to the pleasure her back muscles received in that blissful stretch. She turned with a small grin to Flames. But that was when her jovial attitude turned to horror as she saw his wings stretch as if... Oh god. Was he going to fly?! "Y- You don't l- like climbing?" Nem said swiftly. Maybe she can get away without Flames realizing she was afraid of heights. That she was less than a dragon..
Flames turned to her, a bit confused. He slowly folded his wings back into place, seeing as she didn't want to fly. He was ok with not flying, but was just confused on what the problem was, flying was a lot faster, but if she preferred not to then that was perfectly fine with him. "No.. I like climbing.. if you want to just walk and climb there, then that's fine with me." Flames replied, being calm and trying not to think of flight. Nemesis exhaled a long yet quiet sigh in relief. The beads of sweat that were beginning to align on her forehead like constellations vanished. She forced a smile again. "Y- Yeah... Um..." She blushed. "It's j- just that.... I'm scared of..." She swallowed. "Heights." She wondered what the god would say. She swiveled one ear back nervously, and looked at Flames with a small nervous frown. Her tail tip flicked side to side anxiously. Flames' eyes widened a bit at the sudden realization. Afraid of heights? it was definitely strange for a dragon, but he didn't want to judge her at all. "Oh... I understand now." Flames replied, smiling at her kindly. "Don't be shy, everyone's afraid of something, I understand perfectly." He finished speaking, wondering what her reaction would be. Nemesis, for once, wasn't surprised at Flames' response to her confession. Having known him for-- What, fifteen minutes? 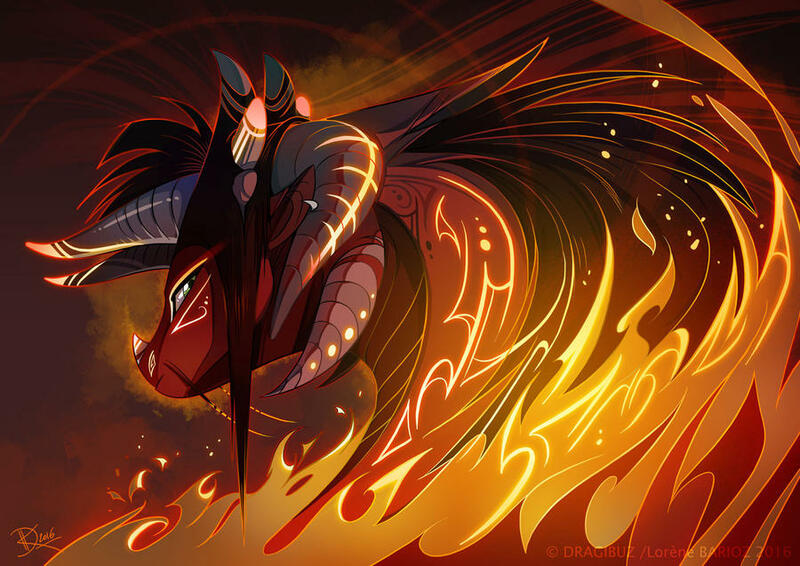 --it was obvious that Flames wasn't the type of dragon who would instantly despise a dragon for a single realization. Nemesis was grateful for that. She closed her bright yellow eyes, sighing. Then she smiled. Her eyelids slid open again. "Thank you.. Flames. You're... Really nice..." She realized with a shock that she didn't stammer at all in that sentence. Maybe it was just that she was so used to Flames by now, knowing that she felt safe around him, that she didn't feel so scared anymore. "I... Bet your volcano is nice, too..!" Flames chuckled at her replied, seeing that she looked like she was in a much better mood then before. He was glad she was, he liked to see others happy, rather then sad. "Wow.. thank you, I'm just being myself." He smiled at her happily, since she was in a greater mood, he was as well, he was also now getting a bit more used to her. "Oh, I think you'll love the volcano, its got loads of stuff to read, I nice nest and I can make you tea as a refreshment as well. Just tell me when your ready to go and we'll be on our way." Flames said, getting ready to go. Nemesis felt a jolt of excitement shudder down her spine as she heard the word 'tea'. That sounds great!! Nemesis only made tea once but accidentally left it boiling for too long, but she had heard that it was such a great beverage. Though the FireWing was a dour and melancholy introvert, she got in on some rumors (in which some she didn't believe, and others she did), and the one about tea sounded the most appealing. Nemesis wasn't tagging along only for the refreshment though. Flames was a really nice guy, and Nem hoped to keep up a friendship with him for a long time. "That all sounds really nice..."
Before declaring that she was ready to go, the dragoness stretched out each of the toes on her good feet in preparation for climbing. She was, admittedly, a good climber, but a warm-up never hurt anyone. ((False XD once I broke my arm from tripping over my shoelace in soccer warm-ups.)) Then she kept smiling at Flames. "I'm ready." Flames nodded to hear that she was ready and stretched out his toes as well. He didn't usually climb to his home, he wasn't quite used to it, but he also didn't want Nemesis to climb alone. Alright, well lets go now, we don't want to waste anymore time." He replied, starting to walk towards to where his volcano was, expecting her to follow him. The climb wasn't that hard, as that was what Nemesis discovered. The nearer she got to the entrance, the warmer she felt. It wasn't unbearable, really, since the FireWings were built for this kind of heat. Nemesis followed her new friend Flames into the volcano. "Wow...! This place looks great..!" When flames finished his climb to his volcano, getting there about a minute before her. He slowly opened the large wooden double door to his volcano. Inside were about 8 bookshelves, 7of them filled, while 1 was only a quarter filled. He had a small bed in the back, a rather large table, a dresser with 3 drawers, each containing something different. Other then all that, everything else was basically like any cave or home. "Wait, really?" He asked as he heard her reaction.